Can I change the height position of the screen? Yes, the height of the screen is adjustable to fit the user’s most comfortable viewing position. Place your hands on the soft touch coating on both sides of the screen and slide it up or down. You can also tilt the screen. Is it normal that the light slowly flashes yellow when the unit is turned off? Yes, when the system is in standby mode. When you turn on the system it flashes green and during usage it is constantly green. Will the unit start with the same settings as before I turned it off? Yes, if you turn off the system by using the on/off button (AF off is not saved). If you pull the cord or there is a power outage, the settings will not be saved. Why does the red switch light suddenly flash yellow? The reason is that the autofocus is locked in a fixed position. A yellow continuous light means that the system is not using the default settings. Can I change the lamps of the system myself? No, the LEDs have extremely long lifetime. If they need to be changed, contact your distributor. Is there a carrying case suitable for MagniLink Zip available? Yes, it is included when shipped for both 13” and 17” models. Also available as an accessory. I got lost in the menu in Full settings mode. What do I do? Go back to the Basic mode - press/hold button 4, press/hold button 3, and (while holding) press button 5. Wait for a little while, and the system will automatically take you back. Why don’t you offer a pivot function? Pivot is not very useful in systems with small monitors. Is it possible to exchange the battery? Yes, the battery can be exchanged by the user. Is there any way to save power so that the unit could be used one full day in school? Yes, by setting the menu option for SLEEP or SH-OFF active the unit will automatically save power by entering the system in standby(SLEEP) or even turn it off completely(SH-OFF), the functions is triggered by movement sensor or if the user is using the control panel or not. See manual for further information. Could the system be used for putting on makeup? Yes, the camera could be rotated 180 degrees and picture is mirrored by function in menu. Could the language of the OSD menus be changed in some way? Yes, by entering the menu called OSD, there it could be changed between English, French, German and Spanish. Yes, if you order the accessory C (HDMI/USB connection), then the MagniLink ZIP could be connected via USB to an external computer with EUC. Please see order form and pricelist for more info. Can I connect the MagniLink ZIP to a computer or external monitor? Yes, if you order the accessory C (HDMI/USB connection), then the MagniLink ZIP could be connected to an external screen or to a computer by using USB. Please see order form and pricelist for more info. Is connection to Mac possible? Yes, software for both PC and Mac could be ordered as an accessory D (Software WIN / MAC for computer connection). This option will also include HDMI/USB connection. Please see order form and pricelist for more info. Is it possible to upgrade the software with OCR/TTS afterwards? Yes, by ordering the MagniLink ZIP with accessory C (HDMI/USB connection), the unit could be upgraded to OCR/TTS functionality later on. Otherwize, it's not possible. Please see order form and pricelist for more info. Which Windows and Mac versions are recommended? Windows 7, 8, 8.1 or 10. MAC OS X Version 10.6 Snow Leopard or later. 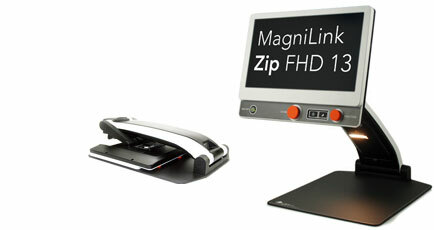 Which assistive software can be used together with MagniLink ZIP? ZoomText, SuperNova, iZoom and MagniLink iMax can be used. Windows Eyes and JAWS with some exceptions. Can MagniLink ZIP be used both with USB 2 and USB 3? Yes, we recommend USB 3 for best performance (60 full frames per second). Use of USB 2 might need extra cables, please contact LVI for more information.